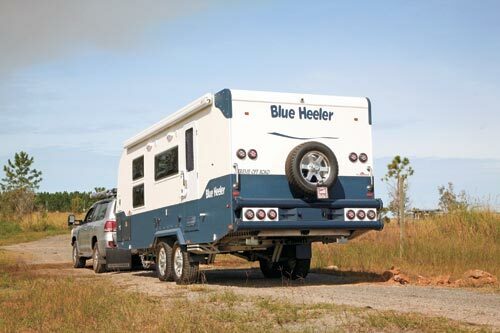 Sunland’s Blue Heeler offroad caravan has been around for a few years now, and has proven itself to be a very capable caravan. But the Sunland team never stands still and, in recent times, the Blue Heeler has been upgraded. 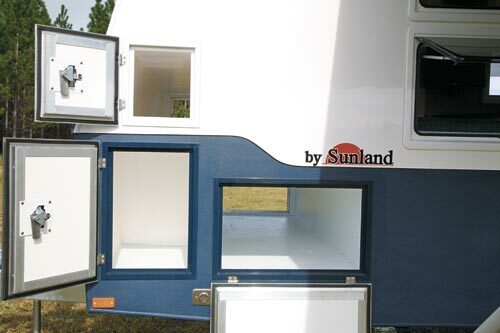 Sunland’s chassis has taken a radical shift away from the usual RHS steel box section design. Instead, a composite chassis with marine grade structural aluminium main rails and a galvanised steel sub-chassis which supports the suspension is used. The offroad Blue Heeler rides on Cruisemaster coil spring and shock absorber-fitted independent suspension. A look under the van reveals plenty of ground clearance, and the pipework and cabling is tucked well out of harm’s way. The punched-hole aluminium rails perform the very useful function of holding the piping and cabling. 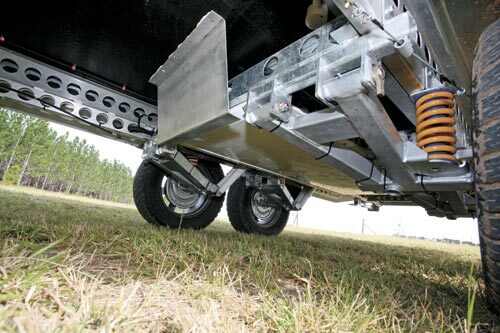 The drawbar is a conventional affair, made of 150x50mm (6x2in) RHS hot-dipped galvanised steel, with a Hitchmaster DO35 offroad hitch at the pointy end. The walls and roofs are made of composite fibreglass with aluminium framing, and the result is a van with a very purposeful air about it. The blue of the lower waist only adds to that impression. It’s a Blue Heeler, so what other colour would you expect? A Raptor coating – a protective urethane finish – has been applied to the front, sides and rear of the van, and one-piece foam core fibreglass is used for the floor. That not only gives strength but good insulation as well. The van has a small front boot, which is really only for the gas cylinders. But it does have two front tunnel boots – the lower one is much larger than the upper one – as well as two smaller bins on either side. At the rear, two large pole-carriers offer even more storage. In short, there is no shortage of external bin space! The Blue Heeler’s interior colour scheme is definitely the first thing that catches the eye. 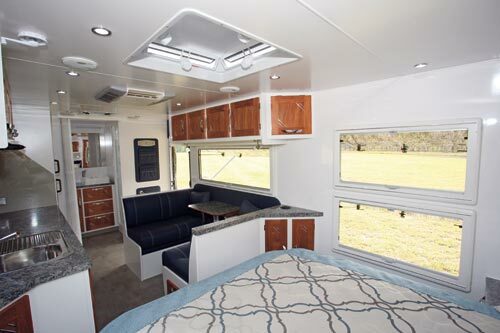 It’s an interesting mix of the traditional – timber cabinetry – with the contemporary – a glossy white finish nicely offset by the blue leather upholstery of the dinette and the fridge doors. It might sound like an odd combination but, to my eyes at least, it works very well. 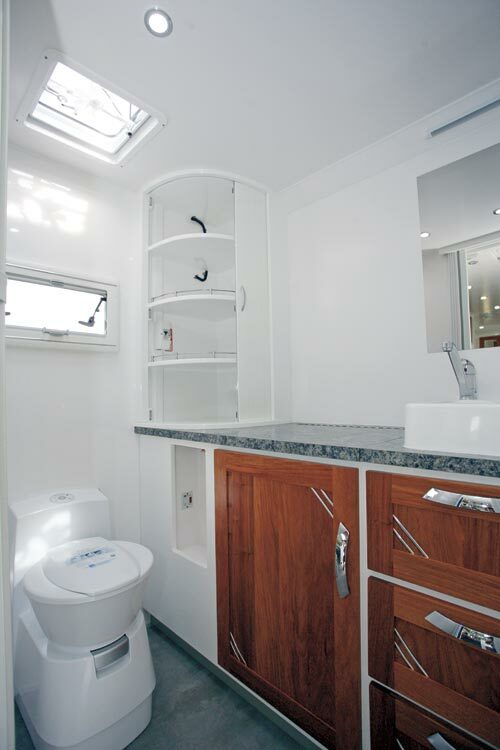 To the right of the rear entry door is a full-width rear bathroom and, to the left, a café-style dinette. The kitchen bench occupies most of the mid-offside wall, leaving the front of the van for the bedroom. Windows everywhere, including tandem hoppers at the front, result in a very bright interior by day. There are light fittings everywhere for good illumination by night, which is common for a Sunland. Buyers who prefer a large bathroom are going to be well-pleased with the Blue Heeler’s. 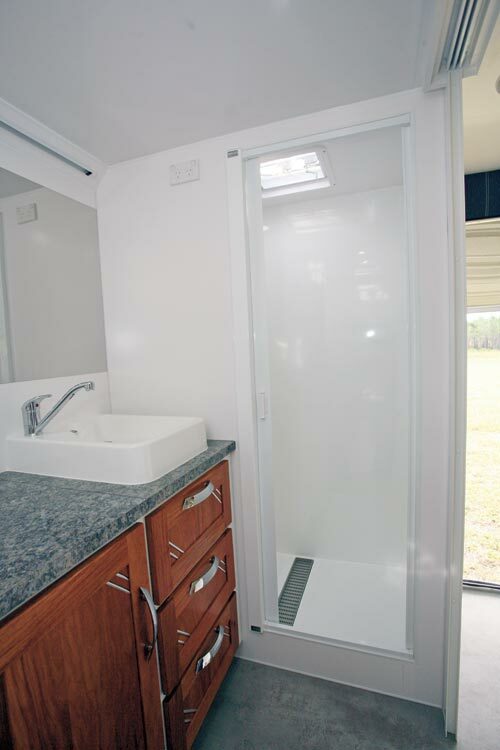 It has a good-sized shower cubicle with a roller blind door and a couple of moulded shelves. In addition, a new drain has been designed to ensure that minimal water is retained. The vanity cabinet is a thing of beauty, with a washbasin on the bench, three good-sized drawers and a wall mirror. The top-loading washing machine is housed in what appears to be a large cupboard. But storage space is not lost, because the large roller-shuttered cupboard in the rear offside corner does the job nicely. The hot water switch is located in a little compartment to the side of the Dometic cassette toilet – it’s handy if you’re sitting on the loo but, otherwise, you’d need to know where it is. The Blue Heeler’s kitchen is up there with the best of them. In some ways, it’s fairly standard but the angled corner at the forward end blends neatly with the island bed and also offers a bit of extra cupboard space. That’s in addition to the cupboard, three drawers, wire basket slide-out pantry and three overhead lockers. One of the lockers houses the control panel with 12V fuses, sound system touch control panel and water tank gauges. The solar panel regulator isn’t there – it’s almost at floor level by the entry door and best seen when standing outside the van. 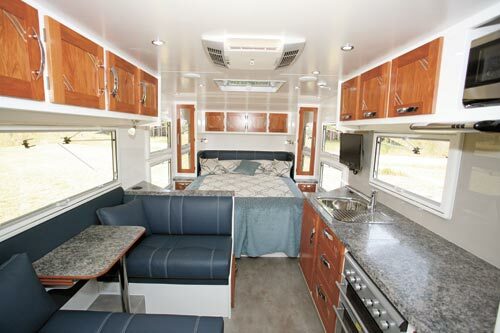 The kitchen comes with all the expected items: stainless steel sink with drainer, four-burner cooktop (one electric, three gas) with griller and oven, and an overhead microwave. Fitting in between the kitchen bench and bathroom is the 215L Waeco 12V compressor fridge. Bench space is moderate but greatly improved by the flush lid for the cooktop. Powerpoints aren’t obvious but that’s because they are the tower style that disappear below the bench when not in use. There’s a matching one near the dinette as well. When the food is cooked and it’s time to sit down and eat, the contoured leather seats of the dinette are pretty comfortable. While four people might fit, the wheel arch means it’s more comfortable for two. The tri-fold table makes sitting back and relaxing with a drink very easy. One of the dinette features is the large adjacent window, which makes watching the passing scenery a very pleasant occupation. Four overhead lockers and a drawer under the front seat supply the necessary storage. Given the open nature of this layout, the bedroom sits up front in all its glory – the twin windows on each side, and the mirrored side wardrobe doors add to the effect. Measuring 2x1.52m (6ft 7in x 5ft), the innerspring mattress should accommodate even the largest people without a problem. Lifting the posture slat bed base reveals an under-bed storage area that’s a bit different to normal. Instead of a large open space, there are four drawers – also accessible without lifting the bed – and an open space in the middle between the drawers. Given its Tare of 2496kg, the Blue Heeler doesn’t fit into the Toyota Prado class of tow vehicle, But it doesn’t require an oversized tow vehicle unless the Blue Heeler is fully-loaded – it has an ATM of 3500kg, which gives it a very generous load capacity. I always thought the Blue Heeler was a great little offroad caravan to start with, but the latest changes and upgrades have certainly improved the breed. 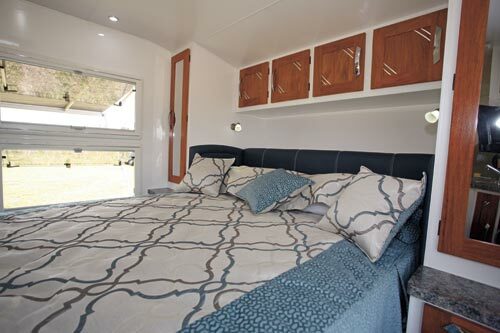 Being a purpose-built offroad caravan both above and below the chassis, the Blue Heeler has much to offer the keen explorer who wants to visit the back blocks of Australia in a bit of style and comfort. Originally published in Caravan World #519, October/November 2013.